I know it is not officially the last day of summer, but labor day sure feels like the last day of summer. I’ve spent the past week trying to check a few more items off my annual summer bucket list. One of my personal favorite outdoor activities in Western Pennsylvania is stand-up paddleboarding. If you have been wanting to try out this sport, and trust me – it is beginner friendly, this weekend is the perfect weekend. The weather forecast for labor day weekend is PERFECT – sunny and hot, but not too hot. 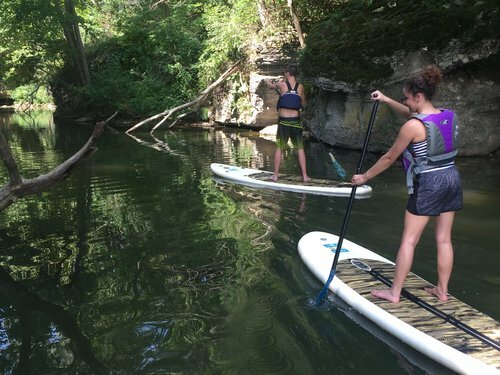 My favorite paddle boarding outfitter, Surfsup Adventures, is offering a great end of summer discount too – $40 off the normal rate. When he is not guiding trips at Moraine State Park, Ian Smith is also the founder of the non-profit First Waves that partners with organizations like Big Brothers, Big Sisters to get more kids out on the water to try paddle boarding, learn about conservation and filmmaking. I have volunteered with First Waves in the past and it is an impressive operation. Check out FirstWaves.org for more.